Thanksgiving can be a VERY expensive holiday. You have to buy an expensive bird, booze, and tons of veggies and desserts. After an expensive summer holiday with the kids, who has money left for a big holiday now? Because we LOVE our family and friends so much we still want to make it super special. Here are my tips and tricks to make a yummy bird and Thanksgiving day but still on a budget. 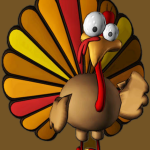 This year why not stop the turkey tread mill and decide that this will be the best holiday so far! We want to give thanks to everything we have and here is the way to do it on a budget! 1. Shopping: Take the kids to a farm or fair and buy everything fresh. The kids can pick apples, pumpkins or peaches and save money at the same time. Buying from farmers saves you money, gets you fresher food, the kids will be tuckered out, and it supports our local economy. Check if there is a farmers market close to where you live. Sometimes the markets in the core of a city are more expensive so drive out to a rural market and exercise your kids and your budget. 2. Bird: Order a fresh turkey from a local butcher. It’ll be local, be super delicious and will again support your neighbourhood small business. Sometimes you have shop around to get a good price on one of these too. I have a Portuguese butcher down the street from me that I save a ton on and I know it will be a mean bird for my guests. 3. Cook it like Martha: Here is Martha’s Perfect Roast Turkey recipe. Follow it to the letter BUT then add bacon. I add an entire package of bacon on top of the fresh turkey and it is killer. Make sure you baste the bird with the combined turkey and bacon drippings every thirty minutes to make it super juicy. I love you Martha! 4. Giving: Take one of the extra days in the long weekend and drop off some food or money to a shelter or charity. It won’t cost you much more and the good feeling will get you back in tune with the point of the holiday – being thankful. If you’re adventurous, volunteer somewhere with the kids and your love monkey and see how much you really feel grateful for. That is the entire point of the holiday. Make sure to take some time and give thanks for everything you have. 5. Family Fun: Here are ten things to do with the kids that will make it memorable for everyone. Make this Thanksgiving the BEST turkey day ever and bang off all eight of these items. These items are in Toronto click here but you can find things to do in your home town too. 6. Make your own pies and save. Now that you’ve been to all of the fall fairs and have tons of yummy produce for cheap. Make your own pumpkin, apple or berry pies. It’ll give you another way to get the kids busy, save you more money and really show all of your guests how much you love them. Best way to show your love is through there stomachs! Feed ’em and squeeze ’em this weekend.